The UK seaside resort Blackpool has reopened its tramway after a £100 million upgrade, reigniting public interest in the use of light rail vehicles in urban environments. Despite being the first European country to pioneer the use of trams – the first system in the UK was opened in Birkenhead, 1860 – trams are relatively under-utilised in the UK compared to other methods of transportation. Trams have changed radically since they were first pulled by horses through North West England. Blackpool’s new trams are computerised, articulated and travel across 11 miles of coastline 15 minutes faster than the trams they replace. The history of tramways in Europe is more roller-coaster ride than train trip. After widespread adoption, most were closed down during the first half of the 20th century in favour of cars and buses. However trams have recently undergone a renaissance, with many European countries keen to introduce low carbon mass transportation to help meet EU carbon emissions targets. In the UK there are eight tram networks in cities across the UK, five of which were opened in the last 20 years. 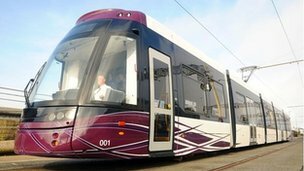 Several new tramlines are also planned, including the controversial Edinburgh Tram Network, which should have been opened last year, but is now planned to open in 2014 at four times its original cost. Do trams have a future role in the urban transport mix? Blackpool certainly seems to think so with local politician Tim Ashton declaring the new tramway “a world class system fit for the future”. However not everyone agrees. Several years ago the UK’s National Audit Office said in a report that though £2.3 billion had been spent on 12 new schemes since 1980, “passenger numbers have fallen ell short of forecasts”, with some systems reporting numbers 45% below expectations. It would be interesting to see if there is any more recent evidence on trams to pin down their undulating popularity.